Unlike anything on the market today, ViviStrata builds on our existing glass capabilities and layers them with beautifully etched designs that blend the eye of a textile designer with the latest in etching technologies. ViviStrata’s distinctive look lies in our etching process and proprietary techniques that allow us to create extremely precise etched designs. This translates into crisp details, fine lines, and intricate small-scale patterns that put ViviStrata glass into a visually exciting league of its own. On top of its aesthetic advantages, the ViviStrata etching process has a compelling environmental story: because it’s a physical process, it uses no harsh acids or chemicals and generates no toxic waste. The ViviStrata line is comprised of two unique families, each defined by the way it incorporates the etched designs. 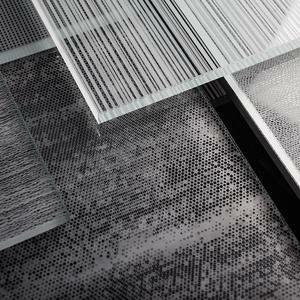 ViviStrata Monolithic glass consists of a single tempered glass lite with etching on one or both sides. Eight etched patterns—Palisade, Stripes, Hive, Plot, Glint, Surge, Canopy and Ripple—offer intriguing design possibilities. 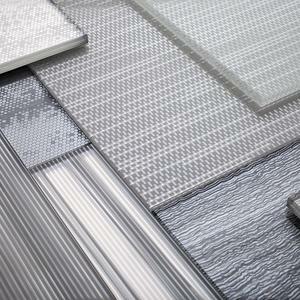 Monolithic glass is standard in a thickness of 10mm, but other glass thicknesses are also an option. 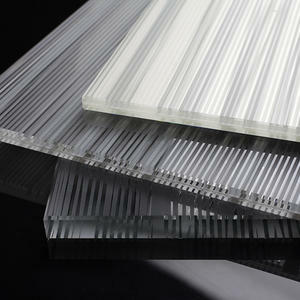 ViviStrata Layers glass dramatically expands the line’s reach. 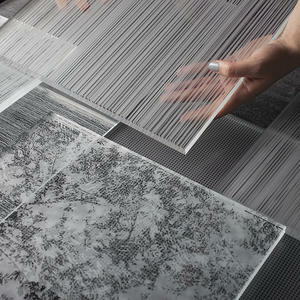 These multi-layered patterns feature one or more color graphic interlayers laminated between two lites of glass, with etching on one or both glass lites. Eight standard patterns—Palisade, Glide, Hive, Plot, Glint, Surge, Canopy, and Ripple—are a dynamic interplay between etched surfaces and interlayer colors and graphics. Each pattern blends transparent and opaque areas, and instances of light refraction and diffusion, to create a sense of depth and dimension that shifts as light and viewing angles change. The visual effects are stunning. All ViviStrata glass has an invisible protective sealer that repels dirt, makes the glass surface easy to clean, and ensures the long-lasting beauty of the etched designs. Our standard ViviStrata patterns are merely a starting point. While they offer an impressive breadth of choices, custom variations on Monolithic and Layers patterns, as well as fully original designs, are options as well. ViviStrata glass can be used in all of our Systems products, including LEVELe Wall Cladding, Columns and Elevator Interiors; LightPlane Panels; Silhouette Railings; and Doors. It can also be specified in sizes up to 60” x 120” (1524mm x 3048mm) for use in partitions, room dividers, backlit displays, and other custom applications. To learn more about ViviStrata, head to the F+S website. You’ll find complete product details on our ViviStrata Layers and Monolithic product pages. You’ll also find links to the ViviStrata line on the VividGlass landing page.